Published: March 22, 2013 at 03:39 p.m. 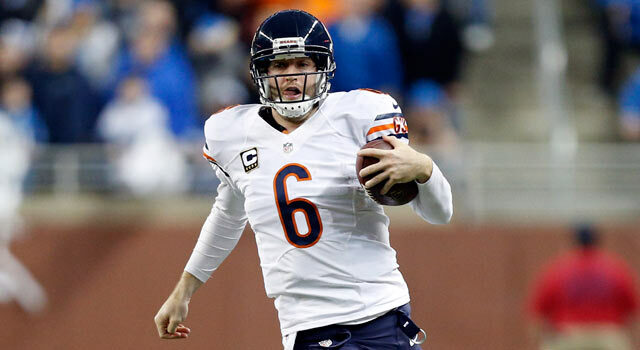 Updated: March 24, 2013 at 09:16 a.m.
Jay Cutler is not a run-first quarterback, but his athleticism is a good fit for the Chicago Bears' revamped offense. Marc Trestman set the football world abuzz when he announced his plans to incorporate the read-option into the Chicago Bears' offensive playbook. While observers around the NFL are shaking their heads at the thought of Jay Cutler utilizing a concept popularized by athletic quarterbacks such as Cam Newton, Robert Griffin III and Colin Kaepernick, I believe the Bears are wise to join the growing trend of NFL teams implementing a tactic deeply rooted in the college game. Last season, four of the top rushing teams in the NFL (Washington Redskins, Seattle Seahawks, San Francisco 49ers and Carolina Panthers) prominently featured read-option concepts in their game plans. Three of those teams landed playoff berths behind a concept viewed as a gimmick by some coaches in the NFL. Interestingly, the Bears finished 11th in rushing yards behind the talents of Matt Forte and Michael Bush, but the inability to muster a consistent ground game down the stretch played a role in the team failing to make the playoffs (despite a 10-6 record). What's most compelling about the read-option, in my mind, isn't the value it brings to the running game; it is the impact that option football has on the passing game. As I continued to dig into the offensive stats from 2012, I noticed that four of the top six teams in yards per play (Washington, 6.2; San Francisco, 6.0; Seattle, 5.8; Carolina, 5.8) were read-option teams that used the threat of the option to create big plays on a variety of play-action passes. Whereas most observers viewed the read-option as the NFL's latest version of "three yards and a cloud of dust" football, the numbers suggest the deceptive concept helps add explosiveness to any offense. Given the importance of explosive plays (runs of 10-plus yards; passes of 25-plus yards) on the outcome of games, it is certainly not surprising that an innovative offensive mind like Trestman is considering adding the concept to the Bears' playbook. Lost in the fascination about Jay Cutler's body language and prickly personality is the fact he is one of the most underrated athletes at his position in the NFL. He has a knack for maneuvering around in the pocket and displays sneaky speed and quickness on the perimeter. Although he certainly is not a runner in the mold of Newton, Kaepernick and Griffin, he flashes adequate running skills as a scrambler when things break down in the pocket. In 2012, Cutler totaled 223 rushing yards on 41 attempts, including two runs of 20-plus yards. Now, those numbers will not place him among the NFL's top rushers, but they suggest he could be a viable threat. While Trestman is not considering transforming Cutler into a primary ball carrier, he would like to keep defenders honest on the perimeter. Cutler rushed for more than 1,200 yards in four seasons at Vanderbilt and was a two-way starter (quarterback and safety) in high school who returned six kicks, a fumble and an interception for touchdowns. Therefore, he is a capable athlete with the necessary toughness and courage to handle some of the punishment that comes along with executing a handful of read-option plays each week. If Cutler is able to average at least four yards per attempt (he averaged 5.7 per carry in 2012), it will alter the way the defense defends the Bears and lead to big gains for the offense. In looking at how the Bears might implement some of the read-option concepts into the playbook, I believe you will see the zone-read/bubble-screen option featured prominently. 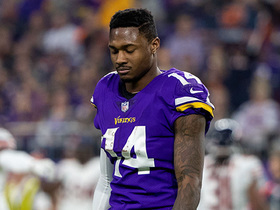 Cutler would read the reaction of the defensive end before making a decision to keep or throw based on the reaction of the second-level defenders on the outside. This would allow the Bears to take advantage of the zone-read concepts without really putting Cutler in harm's way by mandating the throw on the option part of the concept. Therefore, the running game still benefits from slowing down the defensive end, while the quarterback is able to log an easy completion on a high-percentage throw with big-play potential. Additionally, Cutler will have more big-play opportunities in the passing game by utilizing read-option fakes in the backfield to lure linebackers and safeties to the line of scrimmage. With second-level defenders creeping up to defend the run, the Bears can flood the secondary with an assortment of seams and vertical routes to exploit the voids over the middle. This was an effective tactic for the 49ers, Redskins and Panthers in 2012, and it could pay major dividends for the Bears with a strong-armed passer like Cutler in the fold. The beauty of the read-option is that it blends the zone running game with option football. The zone-based scheme, which was popularized by Alex Gibbs and the Denver Broncos in the 1990s, instructs offensive linemen to work in unison to own the line of scrimmage. Offensive linemen will step in sync to the direction of the play to eliminate penetration, while eventually creating seams for the running back. The runner is instructed to follow a "one-cut" rule, which gives the back the option of making only one cut at the point of attack rather than dancing around to find potential holes. When executed properly, the zone-based scheme produces positive yards consistently and creates headaches for defensive coordinators. With the read-option melded into the scheme, the play caller is able to create conflict for the backside defensive end due to the threat of the quarterback run. The defensive end must hesitate for a count or two to make sure the quarterback has handed the ball to the runner before pursuing downfield. As a result of the pause, runners routinely are able to locate open seams on the backside for significant gains. In the Bears' case, Forte and Bush are excellent inside runners with terrific vision and instincts. Both excel at finding creases in the middle of the defense. Forte, in particular, is a standout runner with a slithery running style that suits a zone-based blocking scheme. He patiently waits for holes to develop before exploding through open alleys. With Trestman adding the read-option element to the scheme, Forte will have bigger lanes on the backside with the defensive end unable to flow fast to the football. For a runner of Forte's caliber, the removal of an extra defender in the box will make him a threat to score from any distance. It's hard to imagine Marshall having a bigger season than 2012, when he totaled 118 receptions for 1,508 yards with 11 touchdowns. However, he could surpass that production with the Bears' utilization of the read-option. To effectively defend it, defenses must commit eight defenders to the box with a single-high-safety defense. This means the Bears likely will face Cover 1 (man-free) and Cover 3 (three-deep zone) primarily on early downs. This ensures Marshall will face a lot of one-on-one coverage on the outside, which is a scary scenario for opponents. 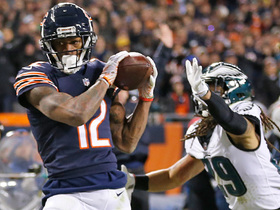 Marshall was targeted 169 times a season ago, nearly three times more than the Bears' next-closest receiver. What's remarkable about those numbers is the fact that opponents routinely rolled coverage to his side to take away some of his opportunities. With the read-option limiting defensive coordinators' coverage options, Marshall will have the chance to feast on single coverage on the outside. 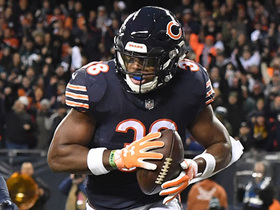 Although he might not see as many balls head in his direction, Marshall's yards per reception and explosive plays (25-plus yards) should increase in the Bears' newfound offense. That's a frightening thought for defenses that were unable to slow down Marshall a season ago.